Hey there! 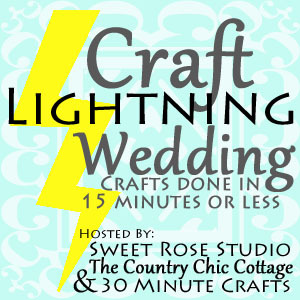 I’m back with yet another craft lightning today, this one is all about weddings! The craft I’m going to share with you today is so ridiculously easy that you are going to kick yourself for not thinking of it sooner. Plus it is one I used in my actual wedding so it brings back some sweet memories. I started off by printing out wallet sized prints of our engagement photos. We had a couple of different scenes (romantic and fun) so I did a variety of prints throughout the reception tables to add interest and variety. After picking up the photos I took them to my local copy center and ran them through their laminate machine. You can also use Self-Sealing Laminating Pouches . You want to make sure you get a good seal all the way around your photo so that it doesn’t get any water inside the laminate. Once you photos are sealed and trimmed you are ready to assemble. Start by adding about an inch of rocks to your vase. Then cut the stem off of your artificial flowers about 1 inch from where all the blooms start. You will want to curl that end piece up so you can tuck it under the rocks and weigh it down. Once you have your rocks and flowers where you want, slide your picture in. Then add water and top with a floating candle. We did these in trios, so the middle tall vase was this setup and then there were two smaller vases that had either rocks and flowers or rocks and a candle in them. Now go ahead and click on over to see ALL the amazing wedding crafts that you can complete in only 15 minutes or less! Love this Ashley! Thanks for joining! I love the idea of laminating a photo and placing it in water! The effect is really fun. Thank you!